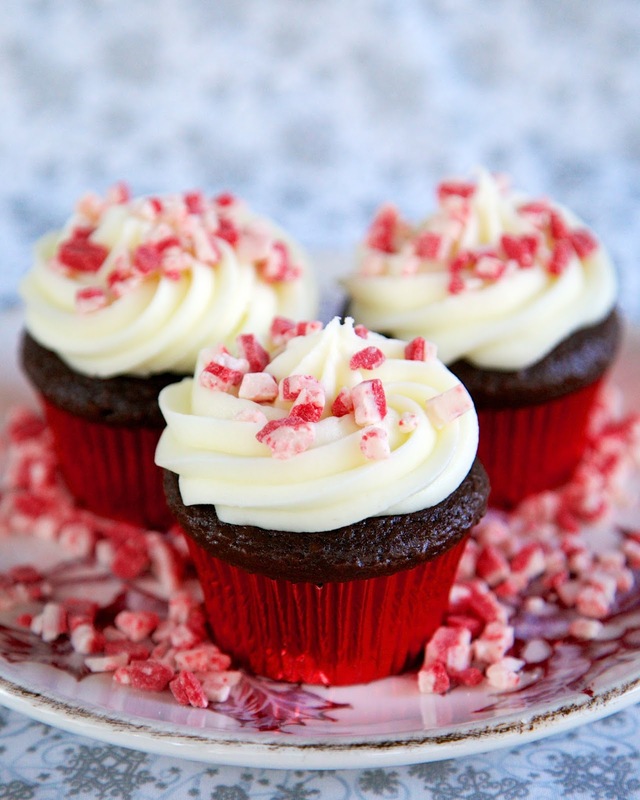 Peppermint Surprise Cupcakes - chocolate cupcakes with peppermint cake balls baked inside. Topped with homemade peppermint buttercream. The best cupcakes EVER! Everyone LOVES this easy holiday cupcake recipe!!! What is the surprise you ask? 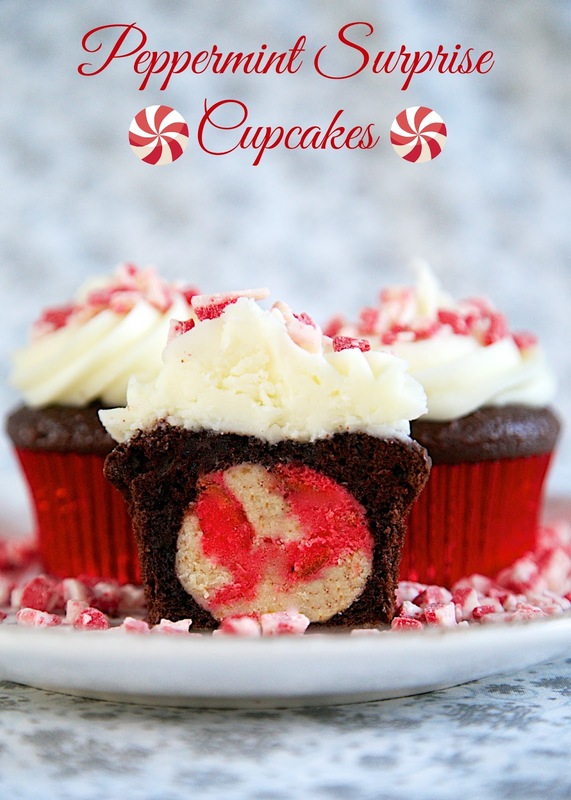 A delicious peppermint cake ball baked in the middle of a chocolate cupcake. Not only do they look amazing, they taste AMAZING! I took these to my friend, Katherine, and she texted me that her family declared these the best cupcakes they had ever eaten! We totally agree!! These cupcakes are a two step process. You will need to make the cake balls first and refrigerate them for a few hours. Once the cake balls are ready, bake the cupcakes and frost them. I made the cake balls at night and finished the cupcakes in the morning. These cupcakes are so festive! We were so grateful to Katherine's family for taking them off our hands so we didn't eat them all ourselves! To make cake balls: prepare cake mix according to package directions, adding 1 tsp peppermint extract. Divide batter in half. Color one half with red food coloring. Pour each color of batter into a 9-inch cake pan and bake according to package directions. Cool completely. Once cake has cooled. Crumble white cake into bowl. Combine with half of white frosting. Mix well until throughly combined. Repeat with red cake. Scoop 2 1/2 teaspoons of each color of cake mixture. Roll red and white cake mixture into balls. Repeat until you have 24 cake balls. (You will have leftover cake mixture.) Refrigerate several hours. To make cupcakes: Line 24 muffin cups with cupcake liners. Prepare chocolate cake mix according to package directions. Fill liners 3/4 full. Press refrigerated cake ball in middle of chocolate cake batter. Bake according to package directions. Cool completely. To make buttercream: In the bowl of an electric mixer fitted with the paddle attachment, cream butter until smooth and creamy, 2 to 3 minutes. With mixer on low speed, add 6 cups sugar, whipping cream, and peppermint extract; mix until light and fluffy. If necessary, gradually add more powdered sugar to reach desired consistency. Pipe frosting on top of cooled cupcakes and sprinkle with crushed candy canes, if desired.